The Montauketts Native American tribe lived on the island of Montauk approximately 400 years ago. This peaceful tribe of hunters, fishermen, and farmers mark the beginning of Montauk’s rich history—a history that attracted New York holistic dentist Dr. Lewis Gross to the island while writing his novel Montauk Dental. The first white settler to arrive on the island of Montauk was Dutch explorer Adrian Block, but the first permanent resident of Montauk—land granted by King Charles I—was Lord Gardiner, who moved from Connecticut in 1639. Lord Gardiner developed a pleasant relationship with the Montauk Indians and often enjoyed the company and assistance of Chief Wyandach. To bring 17th century Montauk—which was organized by ranchers raising livestock along the Montauk peninsula—into the 18th century, President George Washington authorized the construction of the Montauk Lighthouse in 1972. Housing started popping up all over the peninsula during this time, and, to this day, the lighthouse is Montauk’s most recognizable and famous structure. In 1839, slaves who had seized the Spanish Amistad arrived in Montauk, but were quickly recaptured by authorities and then freed in a very publicized trial. In 1879, Arthur Benson bought the entire peninsula of Montauk for the price of $151,000, and his legacy remains in the Stanford White houses, which were built in 1882. In 1895, Austin Corbin brought the railroad from Sag Harbor to Montauk and attempted to make Montauk the port of entry to the United States. Miami Beach developer Carl Fisher made an attempt to make Montauk the “Miami Beach of the North” by building golf courses, the Manor, indoor tennis courts, The Surf Club, the Yacht Club, and the casino on Star Island, but his dream was put on hold when the Great Depression struck. 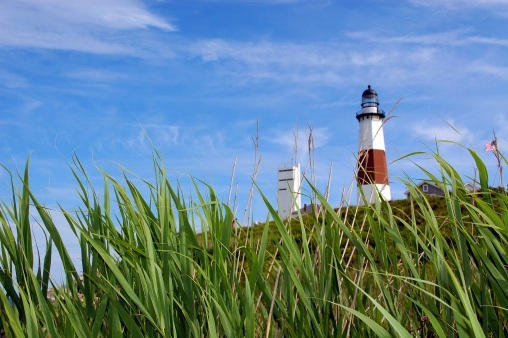 After being flooded by the great hurricane of 1838, Montauk served as an army base during much of WWII. In the early 1960s, Montauk regained its reputation as a popular vacation and resort town. With such a rich and interesting history, it’s no surprise that Dr. Lewis Gross was inspired by Montauk. To find out more about Montauk Tango, visit montauktango.com. This entry was posted in Montauk and tagged 668 The Gig Shack, Dr. Lewis Gross, montauk book, montauk dance, montauk dancing, montauk tango 668 gig shack, montauk tango novel. Bookmark the permalink.